Few words being punched in, life is a bit hectic. Canceled the Wed. ride in order to do a friend a favor. On the way to pick him up the coffin blew some sort of oil gasket, leaving me stranded and throwing a big monkey wrench in things. Didn't even have a bike with me to bail me out. 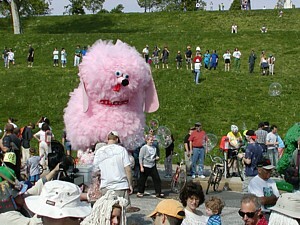 Anyway, a few more pix from the kinetic sculpture race to hold you over. 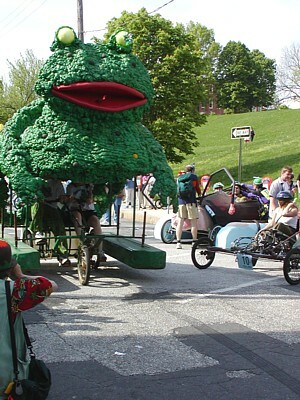 The Kinetic Sculpture race on Saturday was a blast. Unlike last year's rainy weather, this year was warm and sunny. Mr. Frog at the start. Power to the pedal!